I like to keep the recipe simple.﻿ I chop celery for some crunch, add a little mayo to solid white albacore tuna fish and serve on toasted whole wheat bread. I add a pickle as a side garnish - and I am good to go. It’s simple and provides heart healthy omega-3 oils. Like everything in life, you should eat it in moderation because of mercury concerns. For a decadent treat, add your favorite cheese and a slice of tomato and melt it in the toaster oven. I usually cook more elaborate meals on the weekends with the intent of having the leftovers for the remainder for the week. A good alternative to lunch meat is to roast your own turkey breast. This is time consuming, but it’s worth it to ensure that the only thing in your turkey sandwich is TURKEY. Use the seasonings from your favorite roasted turkey recipe and depending on size of your turkey breast it can take 1-2 hours in the oven. ﻿Turkey breasts are readily available year round in your local supermarkets. Eat it for dinner on Sunday and slice the leftovers for a sandwich. I like grazing and snacking. One of my favorite snacks to bring to the office is homemade hummus. I got this idea from Taverna Opa restaurant on a business trip to Orlando, Florida. This restaurant allows guests to make their own hummus using a pestle and mortar. It’s simply chickpeas, garlic and olive oil. By not adding too much olive oil or tahini sauce to make it creamy you save on the extra calories. I make this recipe with my handheld blender at home then toast pita bread in the toaster oven that I cut into 1/8 triangles. I also pack small cubes of any cheese I have in the fridge and have a picnic lunch in the office. Round it out with some fresh fruit and this meal will keep you energized. 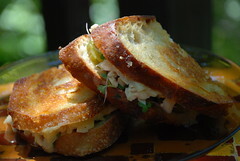 Take some of the leftover turkey breast and make a turkey salad sandwich on whole wheat toast. My favorite ﻿﻿﻿﻿chicken salad recipe is easy and delicious. You can include the pecans or not. I’ve made it without and it tastes great, but don't skimp on the dried cranberries. If you can believe it, I didn’t grow up eating this childhood staple, but this is a simple fix and if you choose the right ingredients can be a healthy choice. I always make sandwiches using whole wheat bread, double fiber whenever I find it. 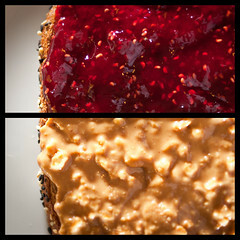 To it I add a minimally processed peanut butter, I enjoy Smart Balance’s Creamy peanut butter with Omega-3, and a homemade strawberry jam from a local farmers market. I supplement each meal with a piece of fresh fruit, baby carrots or low fat yogurt for a balanced meal. What's in your brown bag?